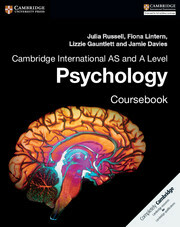 Skills-focused resources to support the study of Cambridge International AS and A Level Psychology (9990) for first examination in 2018. 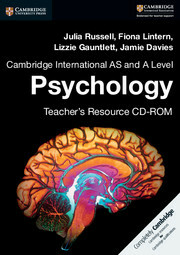 Endorsed by Cambridge International Examinations for Teacher Support, the Cambridge International AS and A Level Psychology Teacher's Resource contains helpful guidance to support planning, delivery and assessment. Detailed teaching guides containing advice for every topic, common misunderstandings and misconceptions, and ideas for in-class activities with additional advice for stretching high achievers and supporting struggling students. The resources are prepared with a strong international focus. Answers to the Exam-style questions from the coursebook are included as well as additional Exam-style questions with answers for extra practice. Fully customisable teaching guides containing lots of ideas for teaching AS and A Level Psychology concepts, advice about lesson structure and differentiated learning support tailored to different students' learning needs. Comprehensive set of answers to all of the exam-style questions from the Coursebook. Extra exam-style questions that are suited to the AS and A Level Psychology syllabus with answers for added support when preparing for examinations.